I've had a couple of comments about why we are doing this Boundary Waters stuff. I told Lois I might comment on that in the next post, which would be this one. But I think I'll wait until the final one in this series. It'll make more sense. We carried all our gear over two portages and found our campsite. Everyone put up their tents. We had a wide variety. Ours was a four man. This was home for a few nights. There were a couple more two and three man tents, but then, we had the mansion across the way, which was the tent we gave our son for his birthday. I think it was a seven person tent. Once we reached our campsite, we put up the tents, the portable table, hauled out the food and started supper. It was later than we thought we'd arrive, so we had to find a place to haul the food up for the night so that the bears wouldn't get it. We had unfortunately picked a site that didn't have trees that were accommodating for such a thing. 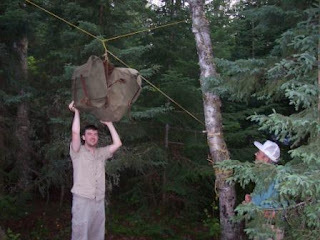 It ended up that the food pack was strung between a couple of trees compliments of some creative tying and hubby hoisting our son on his shoulders to tie it up. Very impressive. The first night was a little weird for most of us because it was so quiet and yet so loud. Noises we were not used to, like loons and, for some reason airplanes. People were sore from portaging. But we got up the next morning and had pancakes, eggs, and bacon for breakfast, and it was a beautiful day. Okay, the lake actually had sparkles. And I have to say, these are not the faces of unhappy people. We had no computers, television, or bars on cell phones. We had the wilderness, and it was marvelous. We had quiet and we had time to sit and talk with one another. We had a different way to live. Some of us freaked out over some of it (and I admit the airplanes in the wilderness freaked me out at three a.m.), but on the whole I think we handled the differentness very well. We were a wide variety of people. Next . . . quiet magic. I keep telling my hubs we need to pitch our tent in the back yard and sleep outside one night. Of course I'm nuts. THAT would be funny with the baby. heather - Yeah, I never had any inclination towards camping when we had little kids . . . for some reason. If you do pitch the tent, just make sure to get inside and close it tight before the mosquitoes come out! Gosh, it's all so beautiful, Linda! Outstanding! You are doing justice to our great trip. Keep it up! I'm anxious to read more. tracy - It was so beautiful you can't imagine. Wait until the sunset pics! randy - It was a great trip and you were the INITIATOR. All I'm doing is documenting what a great deal you and your folks did for us all. I really think that is something I would really enjoy....once! It is really beautiful scenery, but it does sound like a lot of work.....you are really lucky to be able to travel so much and do so many different things. that is the drawback of being self employed and tied to your business like we are. I would love to be able to travel all over the country! di - It is a lot of work getting in, but once you are there, it's so relaxing (next post). We are also self-employed now, but not tied to a particular location - I know we are very fortunate to be able to move around. It's obvious I come from Lois's DNA because camping has never appealed to me in the least. But then you have my brothers who LOVE to camp, so maybe the milk man got involved somewhere in there. Anyway, I'm enjoying this camping trip very much through you. jeff - Believe it or not, I've never been a fan of camping, either. But there is something sort of magical about the BW, so I am willing to put up with some crap!